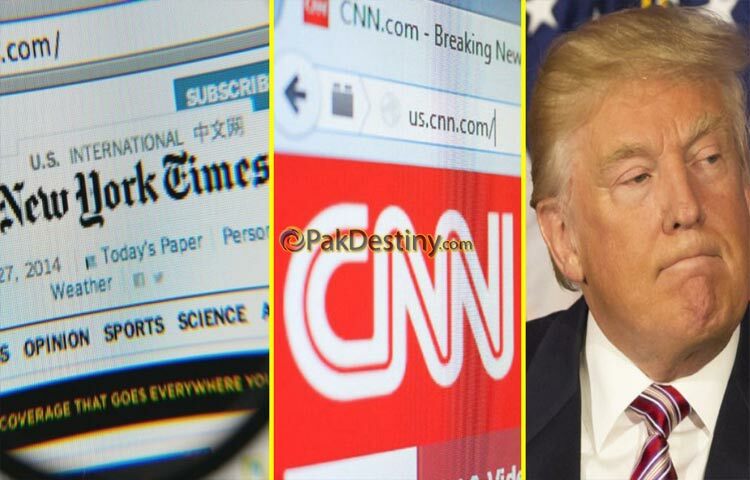 (Pak Destiny) The way Trump is lashing at American media for its ‘fake news business’, it appears that CNN and New York Times are on the agenda at the behest of establishment to unnerve the new president. Both CNN and NYT are on forefront to target Donald Trump since his election campaign. They were so biased that Trump started openly talking about their partisan saying some ‘hidden hands’, a reference to the establishment, are out to target him. Since there has been no let up in their criticism after he got elected president and assumed the office last month the American by the US media led by CNN and NYT. Trump refusing to giving in has described media criticism of him as “fake news” and labeled it as the “opposition party”. He dismissed a growing controversy about ties between his aides and Russia as a “ruse” and a “scam” perpetrated by a hostile news media. Turnbull, whose relationship with Trump got off to a rocky start earlier this month, said the 45th American president should stop focusing on the media. “A very great politician, Winston Churchill, once said that politicians complaining about the newspapers is like a sailor complaining about the sea,” Turnbull said. While this kind of nonsense really ticks me off, I still have to laugh because the liberals are so desperate to bring Trump down — and they’re not doing that because they think he’s going to bring down the US, it’s because THEY KNOW he’s doing a good job and will continue to do a good job. They are running so scared … and they are scrambling!! i wish my parents in law in Md will stop watching this crap news. they are being brainwashed and never what we told them.